1.1．This control system is composed of a separate controller and a separate dump load / diversion load. The two units work together to form a complete wind turbine grid control system. This control system is designed for easy operation with added protection functions. 1.2．This control system is used to convert the three phase variable AC power from the wind turbine to the controller and rectified to DC voltage, then connected to the grid-tie inverter. 1.3. Controller has built-in double over-voltage protection function: when the wind turbine voltage exceeds the dump load voltage setting value, then the dump load will activate, unloading the extra power to the PWM dump load, in the same time there are rated power output to inverter. (Please notice, the PWM dump load will only unload the extra power.). When the PWM dump load shuts down, the controller will switch to brake resistance and stop the turbine. At the same time there will be no power to transmit to the grid tie inverter. The inverter will not transmit power to the utility power system. This two over-voltage protection to the grid tie inverter avoids a burn-out of the grid tie inverter. Most grid tie inverters do not have this over-voltage function. 1.4. This controller can optimize utilized power electronics. When the wind turbine voltage exceeds the dump load voltage setting value, the dump load will only unload the extra power (i.e. higher than the setting power). It doesn’t cut off the controller output power to the grid tie inverter. When the PWM dump load is in activation, there is still full current and voltage to the utility power grid. 1.5. Anti-Islanding: The brake is engaged to stop the wind turbine when the controller detects the utility power grid failure. When our controller detects the grid power failure the controller will switch to the resistance brake and will wait for Grid Voltage.. This is very important in the whole grid tie system to ensure the safety. If there is no Anti-Isolation protection, it will back feed the grid. Our Anti-Isolation provides double protection. 1.6．The dump load is composed of groups of resistors. 1.7. The controller has built-in automatic electric brake (the function is completed via brake resistance). The controller also has a manual electric brake which is convenient for installation and maintenance. 1.8. The 5KW-20KW units are equipped with a lightening arrestor to prevent lighting strike. We can also include this feature on those wind turbines below the 5KW, as a special order. 1.9. LED’S showing DC output voltage. 1.11. 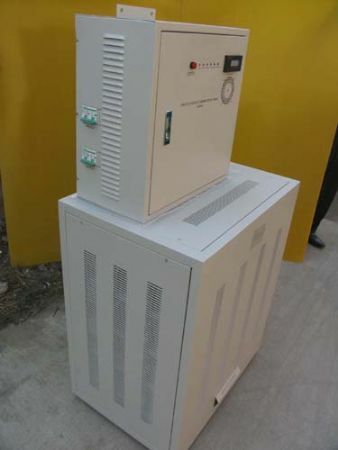 In order for the controller system to be suitable for different specification grid tie inverter(s), the maximum output voltage of controller can be set per customer requirements. 1.12. A manual brake switch is provided. 1.13. Controller has a built-in fuse which protects the grid tie inverter from damage due to over voltage. 1.14. Controller has a built-in temperature controlling fan. 1.15. The controller has LED indicator lights. Make it according to grid power of installation site, please confirm with us when placing the order. 2.1. We can custom make the 4 operating parameters: Dump Load DC voltage, brake voltage, brake time, and low-voltage indicators. Please confirm with us before placing order. 2.2. We don’t recommend using the 2KW wind turbine as a grid-tie unit because it is not economical.